May 2008 – Cashmere baby clothes specialist Stellina Baby has launched a new range of comfort blankies which promise freedom from the hassles associated with full-sized comfort blankets. Regular-sized blankets are bulky and get dirty from being dragged around wherever your child goes. Stellina Baby’s 100 percent pure cashmere blankies are handkerchief sized, meaning that not only are they soft, snuggly and easier for your child to cuddle but they don’t get as dirty from being dragged along the floor. This eliminates the constant parental struggle of prising your child’s blankie away to be washed. The Pralina Comfort Blankie range comes in a choice of three main colours (orange, blue and pink) each including four alternately coloured stripes with a contrasting ribbed border. The blankies are 33.5cm square and are priced at £35.00. They are available from www.stellinababy.com which also features the rest of Stellina Baby’s beautiful cashmere collection. Stellina Baby is a family run business specialising in cashmere clothes for babies, toddlers and young children up to the age of three. Its range is stylish, practical and contemporary, and is updated each season. 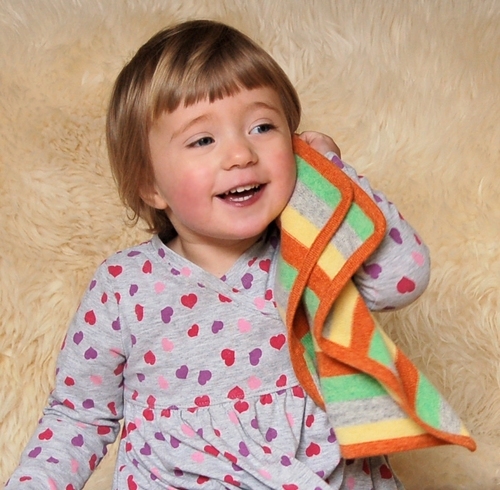 It specialises in clothing of 100 percent cashmere plus an unusual variant with a cashmere outer and soft cotton inner, ideal for children and babies with sensitive skin or eczema. Stellina Baby was inspired by colourful memories of an Italian childhood combined with a love of style, fashion and great design. Visit www.stellinababy.com for further information. An excellent range of close-up and product photography is available on request. This press release was distributed by ResponseSource Press Release Wire on behalf of Potion PR and Marketing Ltd in the following categories: Children & Teenagers, Women's Interest & Beauty, for more information visit https://pressreleasewire.responsesource.com/about.